Time for the final trip entry! Our final two nights were spent at the Toyoko Inn in Aomori City, Aomori Prefecture. This one was right across the street from Aomori Station (as opposed to Shin-Aomori, the shinkansen station…are you sensing a theme?). Guess how the weather was. Go on, guess, I’ll give you a minute. Wow, what smart readers I have! 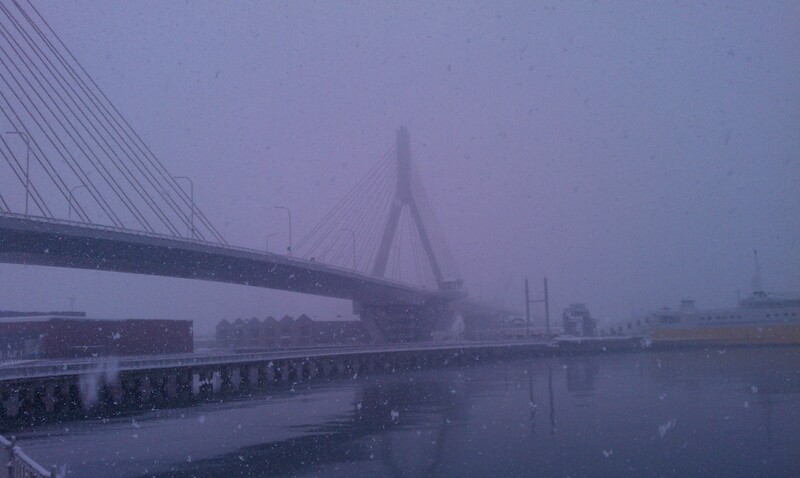 You’re right, it was snowing almost as badly as it was in Kakunodate. My traveling partner decided to soldier with her original plan to visit Hirosaki, a nearby castle town. I balked and opted for a day indoors at every museum within walking distance. It ended up being a great decision, since it was on this day that I saw my favorite thing of the whole trip, Aomori’s Nebuta House Wa Rasse. A little background – festivals are very common all over Japan. There are winter snow festivals, spring cherry blossom festivals, fall cultural festivals, shrine festivals, festivals tied to specific historic events or the founding of a particular town or village. However, almost every locale in the country has its own summer festival. Even Otobe, a town of 4500 people, has two, one for the Bon Festival and another to open the sea pool for the season. What makes up a festival? Well, depending on what’s being celebrated and where, many different things. There’s traditional dancing (local dances and/or the Bon dance), parade floats tugged through the streets, fireworks, food on a stick, beer, and carnival-style games. Otobe’s has all of these (I try to eat my weight in chocolate-covered bananas and shaved ice every August). 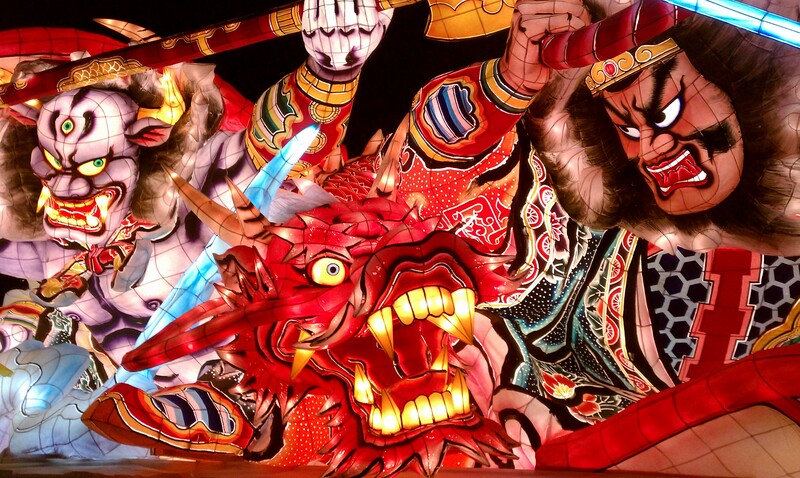 The Aomori Nebuta Festival is famous all over Japan. 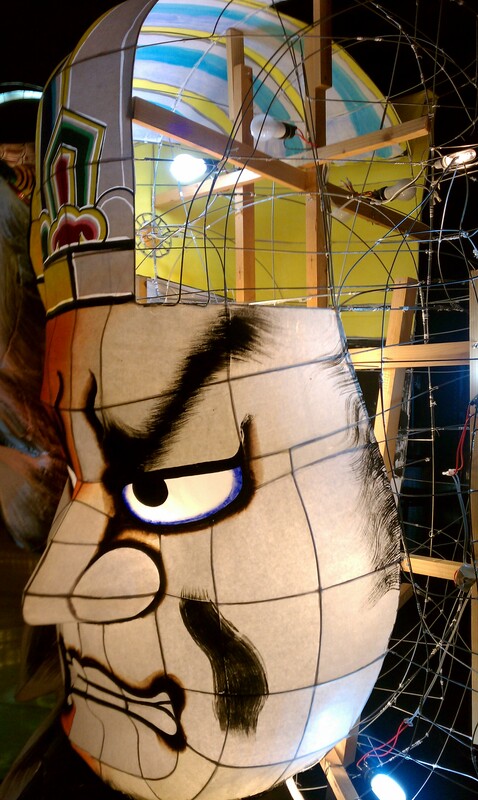 * It occurs during the first week of August; with the ‘Nebuta’ being large, lit floats. 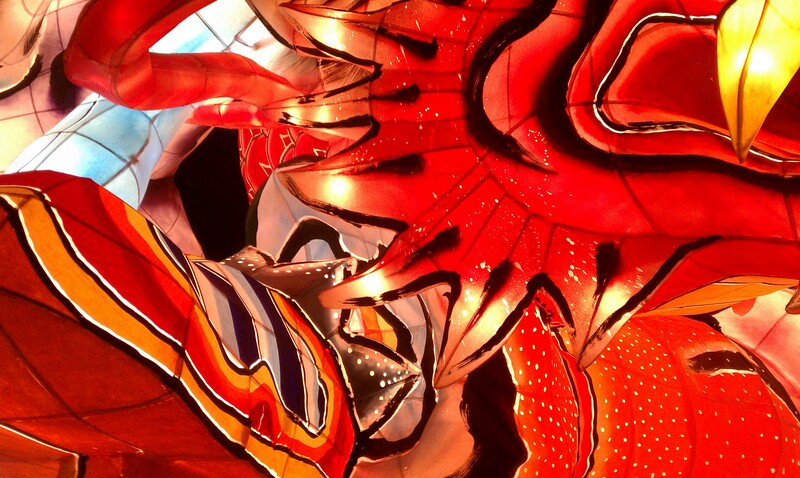 These days special Nebuta artisans create the large floats, which are sponsored by various companies. Nebuta House Wa Rasse is a museum celebrating the festival and includes actual floats used in past festivals. I thought the museum was great – they had a large collection of multimedia about past festivals, including news footage from the 50s and 60s, and a lot of information about the construction of the Nebuta. The Nebuta hall was the best part for me, however. The floats are huge, each the size of an average house. The frames are made of wire tied together with string. Strong paper, dripped with wax to let the light more easily shine through, is pasted onto the frame, one square at a time, and the whole thing is painted brilliantly. Candles used to be used on the inside (eep), but LED lights are the standard these days. Besides the floats, there were profiles of current and former Nebuta artisans and freestanding pieces of Nebuta that you were encouraged to touch. Wandering the floor are knowledgeable guides ready to hop to and explain exactly what you’re seeing. They even give out bookmarks that they’ve made out of the same paper used on the Nebuta, urging you to keep it as a memory of the visit. Nebuta detail – see the dots of wax? My favorite float was War in Takuroku, used in last year’s festival and the first ever to be debuted by a female Nebuta artisan. It’s based on a Chinese myth in which an emperor and a dragon defeat a four-eyed, fog generating monster. The float was created “hoping for the 3/11 earthquake victims’ lives to get better like the fog has lifted”. I’d give the museum an A+ for the non-Japanese speaking tourist. The ticket sellers gave it their best try before I managed to tell them that I could speak Japanese. They had two pamphlets in English that explained the layout of the exhibits and what you were looking at. They also had a printout explaining the myth or legend behind each of the five floats on display, which was great because otherwise they just would have been a lot of angry men and creatures to me. The guides on the floor were prepared to try their English as well, even though they could have ignored me and I never would have known their purpose. After Nebuta Wa Rasse, I went to the prefectural tourist center, a huge triangular building on the edge of the bay. The center’s main draw, a view of the city from the 13th floor, didn’t make much sense on a snowy day, so I hung out on the lower levels. They had some small arts and crafts exhibit, as well as a free shamisen performance. I eventually ponied up for the panorama film showing – a film about the attractions of Aomori projected on a 360 degree screen. Not sure if it was worth the money, but it was beautiful. The first floor of the building was filled with gift shops and food stands, including a place selling delicious apple pastries. From there I went onto the prefectural history museum. It was fun to see, but I wouldn’t recommend it unless you have a strong interest in the history of the area and a modest grasp of Japanese. They had some fun videos that I would have found completely incomprehensible even two years ago. I found the second floor, with its exhibits from the 19th and 20th centuries, the most interesting. 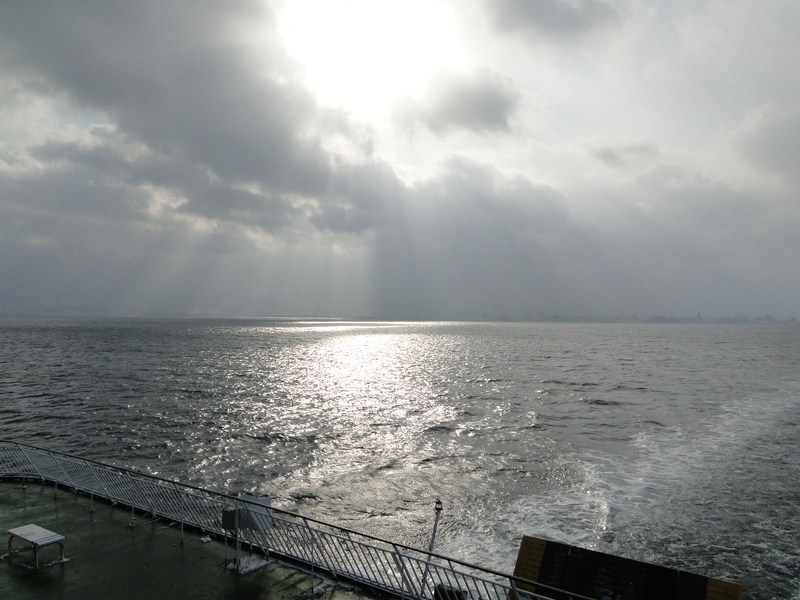 The next day, we headed back to Hakodate by ferry. Since the time period for our Tohoku free pass had ended, it was a cheaper option over the train. 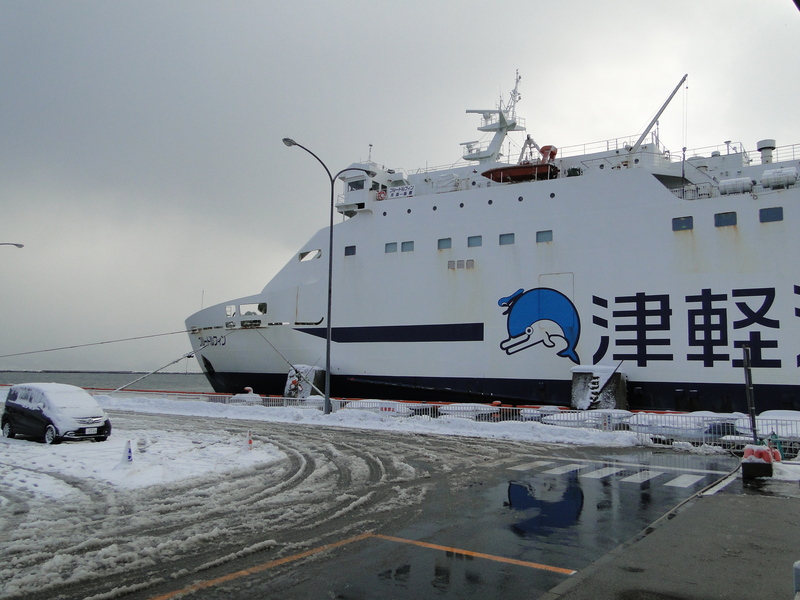 It took a lot longer (about 3.5 hours) and Carlee got seasick enough to be uncomfortable when reached the section of open sea between Honshu and Hokkaido. I had fun though, since I couldn’t remember clearly the last time I had been on a ferry and suspected it was in 2001 on the way to see the Statue of Liberty. And so ends our trip! You poor dears, you’re going to have to go back to reading about my students and culinary misadventures until May at least. *The festival dancing was featured in a ‘come visit Japan’ video two years ago. You can see why they call it hopping, rather than dancing! Float from the 2012 Nebuta Festival in Aomori.